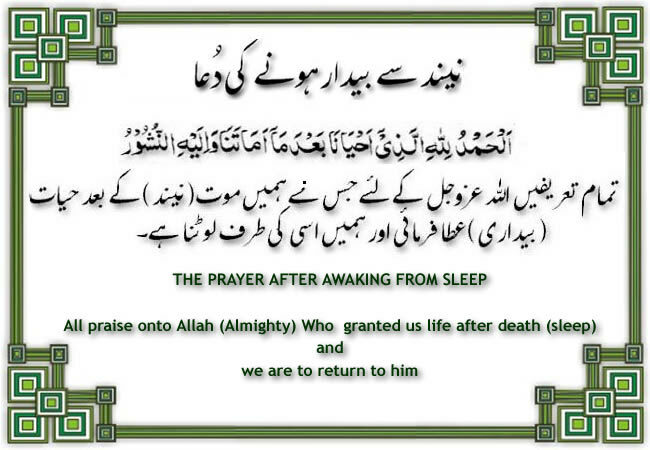 O Allah, by Your leave we have reached the morning and by Your leave we have reached the evening (In the evening say; "O Allah, by Your leave we have reached the evening…), by Your leave we live and die, and unto You is our return. We have entered a new day upon the nature of Islam (In the evening say; "We have entered a new evening …) and the word of pure faith, and upon the religion of our Prophet Muhammad (saw), and the religion of our forefather Abraham, who was a Muslim and of true faith and was not of those who associate partners with Allah. O Allah! Whatever blessing I have risen upon this morning (In the evening say; "Whatever blessing I have risen upon this evening …") is from You Alone, You have no partner. So for You is all praise and unto You all thanks. O Allah! I have entered a new morning and call upon You and upon the bearers of Your Throne, upon Your angels and all of Your creation, to bear witness that surely You are Allah, there is no God but You, Alone, You have no partners and that Muhammad (saw) is Your servant and Your messenger. I entrust your religion and your possessions and your last deed to Allah. There is no God but Allah Alone, He has no partner, to Him belongs the Kingdom, to Him belongs all Praise, He Gives life and Causes death and He is Eternal, He will never die. All good is with Him and in His Hands is the Power over everything. There is no God but Allah Alone, He has no partner, to Him belongs the Kingdom, to Him belongs all Praise, He Gives life and Causes death and He is Eternal, He will never die. All good is with Him and in His Hands is the Power over everything. In The Name of Allah, O' Allah! Indeed I ask You the good of this market and the good therein and I seek refuge in You from the evil of this market and the evil therein and I seek refuge in You lest I take part in a harmful transaction/bargain. We have entered a new morning and so too the entire kingdom of Allah has entered a new morning. Praise be to Allah. There is no God but Allah, Alone. He has no partner. To Him belongs sovereignty and praise and He is upon all things All-Powerful. My Lord I ask You for the good of this day and that which follows it, and I seek refuge in You from the evil of this day and that which follows it. My Lord, I seek refuge in You from laziness and helpless old age. My Lord, I seek refuge in You from the punishment of Hell-fire, and from the punishment of the grave. We have entered a new evening and also all creation in Allah's dominion, Lord of the worlds, have entered the evening. O Allah, I ask You for the good of this night, for its victory and its help, for its light and its blessings, and its guidance. I seek refuge in You from the evil of this (night) and the evil that follows it. In the name of Allah, with Whose name nothing can cause harm on earth nor in the heavens, and He is The All-Seeing, The All-Knowing. O Allah! Grant well-being (health) to my body, O Allah, grant well-being to my hearing , O Allah, grant well-being to my sight. There is no God but You. Rabbana aatina min ladhunka rahmatan wa hayyi' lana min amrina rashada. "Our Lord ! Give mercy from Thy presence and shape for us right conduct in our plight". O Ever-Living, O Self-Subsisting and Supporter of all, by Your Mercy I seek assistance. So rectify for me all of my affairs and do not leave me in charge of my affairs even for a blink of an eye .